Mike Lean, a Scottish nutritionist, has teamed up with an entrepreneur to produce what they claim are the first nutritionally balanced pizzas. They are also said to have a third of the recommended amount of calories, protein and carbohydrate. The pizzas were created by Mike Lean, of Glasgow University, and businessman Donnie Maclean. Prof. Mike Lean, of the university’s human nutrition department said the idea was born out of frustration. He said: “If you go along to a supermarket or a restaurant and buy a meal, then somebody should have thought about it nutritionally. “We’ve recently studied ready meals produced by the top five supermarkets in Scotland – common foods eaten in huge numbers – and they’re hopelessly unbalanced. Donnie Maclean helped Prof. Mike Lean come up with unusual ways of incorporating more nutrients into a pizza. He said: “I researched the market and found that seaweed was an interesting new ingredient being used in artisan bread. Red pepper is also mixed in with the tomato base to give the pizza extra vitamin C. As well as these nutrients, each pizza contains magnesium, potassium, folates and vitamin A. “The way the guidelines are set out, you have 20% of your nutrients and calories from your breakfast, 30% from your lunch, 30% from your dinner, and an extra 20% for snacks,” said Donnie Maclean, the founder of Eat Balanced. A survey by Mintel suggested seven in 10 British adults eat pizza, with forecasters predicting the market will be worth £1 billion ($1.6 billion) by 2016. “For a good number of years I have been trying to help people find easy ways to get a balanced diet,” said Prof. Mike Lean, who is also a consultant physician at Glasgow Royal Infirmary. 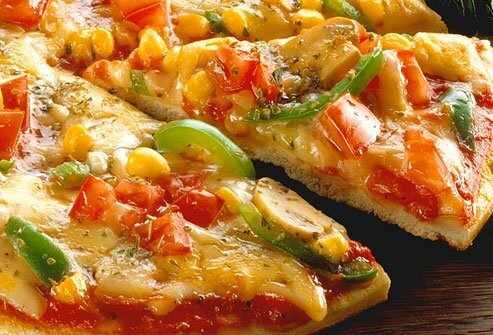 One major British supermarket chain has already indicated it will stock the healthy pizzas, and Donald Maclean is in talks with other supermarkets and catering suppliers. The pizzas will only be available frozen as tests revealed the nutrients were better preserved that way, and Prof. Mike Lean and Donald Maclean said they had to work hard to keep prices down. “Our pizzas are more expensive than most of the frozen pizzas but on a par with the chilled pizzas,” said Donald Maclean. The pair now has other junk food classics in their sights. They are already testing a recipe for a nutritionally balanced curry and, after that, they’re planning to tackle fish and chips.